By Ian Harris, Tung Lin Kok Yuen Canada Foundation Visiting Professor in Buddhism and Contemporary Society, reposted from Asia Pacific Report 32.2 (2008): 1, 7. The Mekong delta area, known in Cambodia as Kampuchea Krom, has been populated by Khmer speakers for around one and a half millennia. Not surprisingly, the Vietnamese annexation of the region from the late eighteenth century created a potent source of unresolved antipathy. On the Cambodian side this reached its modern apogee during the Pol Pot period when the Khmer Rouge pursued irredentist claims to Kampuchea Krom while their campaigns against ethnic Vietnamese were inspired not so much by communist ideology as by something more primordial. Tim Sakhorn faces trial in Vietnam, November 2007. The Vietnamese treatment of the approximately three million Theravada Buddhist Khmer in their midst has similarly waxed and waned, with official policy changing dramatically for the worse in the mid 1980s. At this time Khmer Krom monks experienced difficulties in obtaining travel permits, monastic libraries were confiscated, and monks involved in the teaching about Buddhism and Khmer culture were imprisoned. The authorities believed the Khmer Krom were involved in a subversive organisation, backed by the US, which sought to reinstate the previous non-communist government. 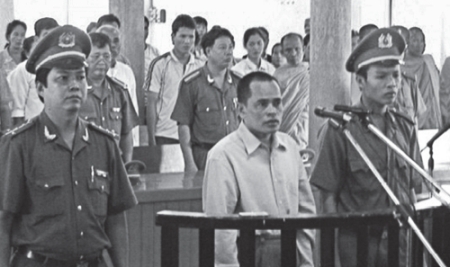 The worst suppression occurred in Tra Vinh province and this explains the case of Venerable Khim Tok Choeng, the province’s chief monk, who was arrested in 1985. His body was finally returned in a sealed Vietnamese-style coffin, his fellow monastics believing that he had been disembowelled. The mode of harassment has eased significantly since this period. But my own visits to the region, the last in January 2005 when I was arrested (and subsequently released without charge) for simply visiting without official permission a Khmer pagoda in Tinh Bien district, An Giang province, suggest that the situation remains far from ideal. Monks are expected to farm the land, an activity contrary to their monastic rule (vinaya), and are generally not permitted to go on alms rounds. Meanwhile at Wat Chantaraingsei in Ho Chi Minh City, the spiritual home of Khmer Buddhism in Vietnam, a canal has been dug very close to the building and the dining hall has fallen down as a consequence. Khmer and Buddhist literature from wat libraries continues to be confiscated and those who secretly keep these books have been imprisoned. Monks are also obliged to study the biography of Ho Chi Minh and maintain his shrine in their pagodas. These are some of the reasons that for every year since 2001 the United States Commission on International Religious Freedom has characterized Vietnam as a “country of particular concern” under the terms of International Religious Freedom Act of 1998. Despite some recent signs of improvement and an official commitment to further positive change, scores of functionaries, both Christian, Buddhist, as well as from syncretic religions are currently imprisoned in Vietnam. Treatment appears especially harsh among the Hmong Protestant and Khmer Buddhist communities—at least two dozen of the latter are currently being detained. In February 2007, around 250 monks in Soc Trang province demonstrated for greater religious freedom, including the freedom to engage in Pali and Khmer study. They also tried to highlight the ban on lengthy traditional ordination ceremonies. 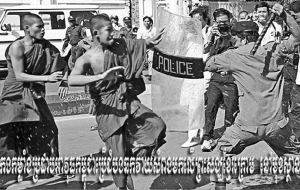 At least ten are reported as having been forcibly defrocked, five were held under house arrest in their pagodas, and in May 2007 another five were sentenced to two-five years imprisonment for “causing public disorder”. Khmer Krom monks protest treatment of coreligionists in Vietnam; Phnom Penh, Cambodia. November 2007. But it is the treatment of Venerable Tim Sakhorn that has crystallized contemporary Cambodian anti-Vietnamese sentiment. Although originally from Svay Tong district in An Giang, Venerable Tim Sakhorn was a long-standing abbot of a pagoda in Phnom Den commune, Kirivong district, Takeo province, Cambodia. Arrested by Cambodian authorities, he was defrocked by a committee of senior Cambodian ecclesiastics in late June 2007 on the illegally dubious grounds that he had been undermining Cambodian-Vietnamese amity by circulating literature and organizing demonstrations to highlight the plight of Khmer monks in Vietnam. He was subsequently handed over to Vietnam where in November of the same year he was sentenced to one year in prison for contravention of Article 87 of the Vietnamese criminal code. In mid-May this year, the United Nations Day of Vesak—the annual celebration of the Buddha’s birth enlightenment and final passing away— was held in Hanoi. This was something of a coup for the Vietnamese authorities. However, as some 2000 international delegates, including a very significant number of monks, gathered to discuss the role of Buddhism in building “an equitable, democratic and civilized society,” it was entirely predictable that neither Khmer Krom monks or nor those wishing to speak on their behalf had the opportunity to participate. Venerable Tim Sakhorn was released from jail on 28 June 2008. His whereabouts are currently unknown. Professor Ian Harris was appointed the Tung Lin Kok Yuen Canada Foundation Visiting Professor in Buddhism and Contemporary Society from January to May 2008. He is currently Professor of Buddhist Studies in the Division of Religion and Philosophy, University of Cumbria, Lancaster, UK and is currently engaged in a Leverhulme Trust-funded research project on Buddhism and politics in pre-Pol Pot Cambodia. He is the author of Cambodian Buddhism: History and Practice (2005) and Buddhism under Pol Pot (2007) as well as several articles on various aspects of Theravada Buddhist ethics and politics. Asia Pacific Report is published by the Institute of Asian Research.